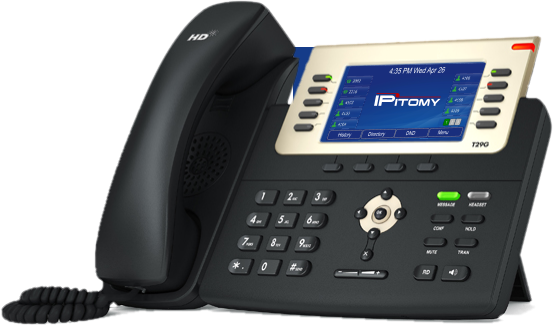 IPitomy1 is a package of hardware, services and support from IPitomy, a leader in VoIP products, services and support. The future of business telecommunications is here. IPitomy1 is a Unified Communications Server for your office. The core of the system is the IPitomy IP PBX System. With tons of features, there are few systems that compare to the quality and performance of IPitomy. The IPitomy Global Telecom network provides high quality calling services that replace the antiquated old telephone lines of the past. 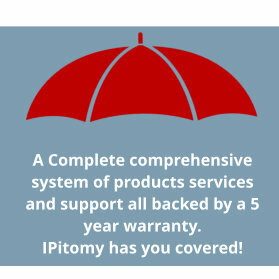 IPitomy is known for our world class support. IPitomy1 packages all of these into one incredible low priced package. IPitomy1 pricing is amazing. The cost is low, the products are outstanding and the service is as good as it gets; far better than the old fashioned unresponsive phone or cable company. 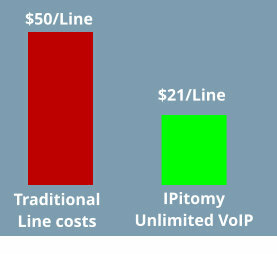 Since IPitomy develops the PBX and is the VoIP Network provider, you save big on combining our services with our products. IPitomy reduces the price by not having high third party expenses and is able to pass those savings on to our customers - without sacrificing quality! Every IPitomy unlimited phone line (SIP Trunk) comes with unlimited calling in the US, Canada, Mexico, UK, US Virgin Islands and Puerto Rico. Additional international calling is available at a very competitive price. The IPitomy cloud has a huge advantage over the old fashioned phone services. IPitomy includes a disaster forwarding feature that sends calls to alternate numbers in the case of a weather emergency, fire or any other reason your connection is lost. IPitomy1 saves 100% on out of pocket costs, and pricing about the same as the phone lines you have now but you get a feature rich new phone system, phones, warranty, unlimited local and long distance calling and support at a fixed cost for 5 years! Reduces monthly expenses by at least $180 while adding features and more phone lines. *After financing of PBX and phones, the equipment belongs to the owner for a $1 buyout. The monthly costs will reduce to $94 per month for the SIP trunk services or renew for all new products and extended warranties. ** State and federal taxes billed separately. ***Basic installation includes basic install and testing using existing cabling and LAN. Additional charges may be added to the payment as required. **** Options that have variable costs will be billed seperately.